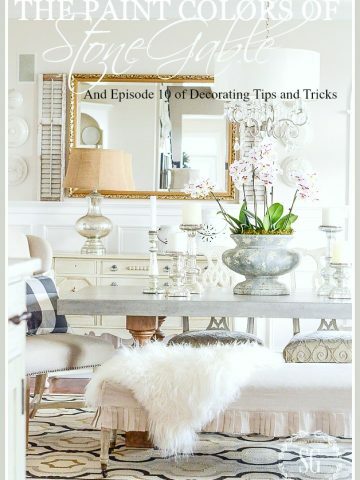 6 MUST HAVE THINGS TO HELP YOU PAINT A ROOM LIKE A PRO!!!! *Make sure to enter a giveaway at the bottom of this post! 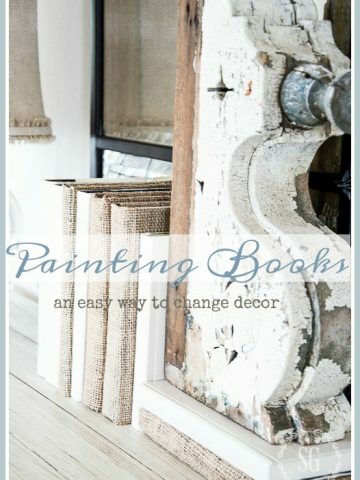 One of the easiest and cheapest ways to give a room a whole new look is with paint! 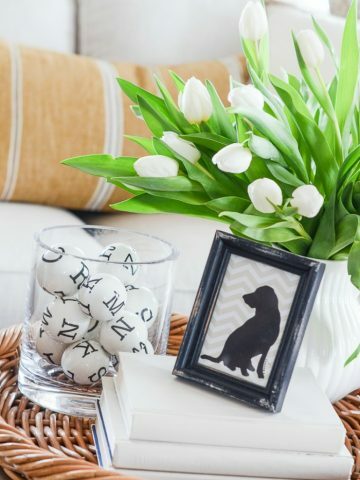 Changing up a color can change the mood and feel of a room… and don’t we love how fresh it makes everything look. I must admit I’m not the neatest painter in the world, so I need a few painting tools in my toolbelt to make a painting job easier, less messy and somewhat enjoyable. Yes, we all need paint and good brushes and roller and a rolling pan and maybe a ladder! Those are essentials! Here are 6 easy, common sense things that are must haves for me when I paint. 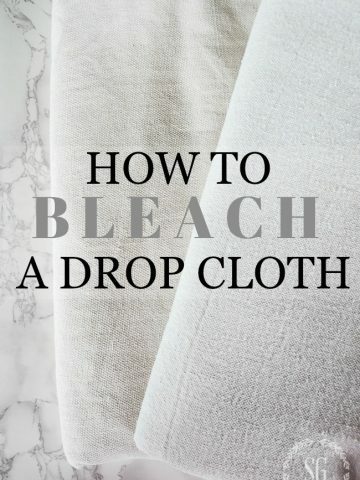 A drop cloth will… not can… save your floors and your furniture and your baseboards from unwanted paint splatters and spills. 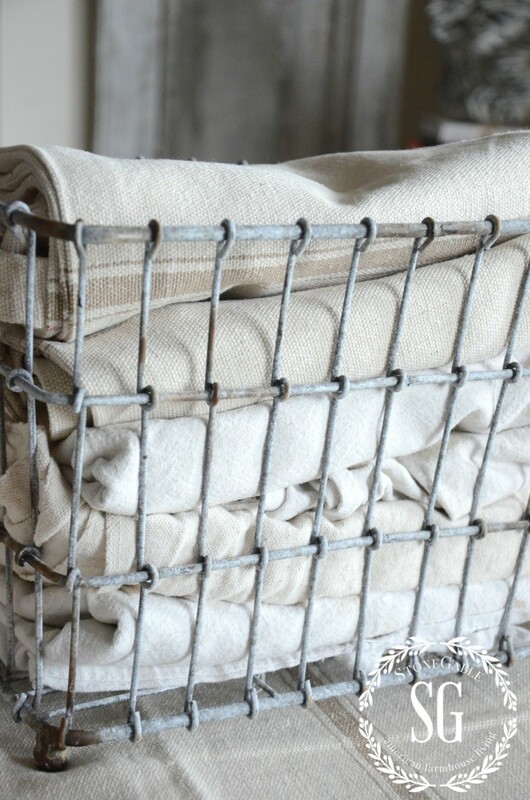 I have a basket full of various size drop cloths and use them not only for larger painting projects but for crafts and other diy projects. Don’t use cheap plastic ones as they can puncture, the paint runs off of them and they are a hazard to walk on! Painter’s canvas drop cloths are the better investment in the long run! When mine get dirty I let the paint dry and put them in the washer and dryer! This tip sounds like a no-brainer. I can’t paint a wall without getting paint on me and my clothing. Sometimes I fling paint past the drop cloth and on to the hardwood floor! Paper towels and a bucket of sudsy water make for quick clean-ups on the spot! Once you make this part of your painting routine you will always have these items on hand. Skip the cheap stuff! Tape off base boards, windows, doors and cabinets for clean, precise lines. It takes a little extra time, but it’s worth it to get a nice neat paint job! Investing in a good painter’s tape will keep you from having to deal with bleeding paint messes. And better quality painter’s tape should not lift the paint off your walls and woodwork! 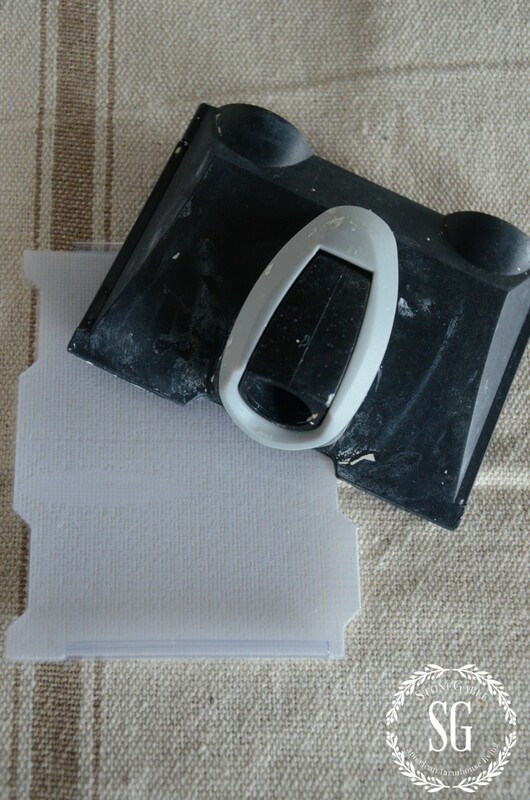 If you don’t like to tape off a room, then try one of these little trim rollers. I think they look like little droids!!! We use these all the time. It makes cutting a crisp line paint on your walls so easy and perfectly done! Bobby swears by them. We get them at our local hardware store. Here at StoneGable painting and loud, head-banging, fast paced music go hand-in-hand! Bobby and I sing to our favorite tunes as the paint brushes and rollers fly! We even play a game… “Guess The Artist”! Bobby has amazing musical knowledge and me… not so much! But, I keep getting better and better as we paint together. I thought that Huey Lewis And The News’ song, I WANT A NEW DRUG was “I Want A New Truck” until just recently…and that song is from the 80’s! One time Bobby bet me a gold bracelet (while we were painting the dining room) that I would not guess the artist of a certain song. It was ALL ALONG THE WATCHTOWER. I knew the artist, Jimmy Hendrix, because of his distinct voice but had never heard the song before!!!! HELLO, pretty gold bracelet… Score!!! Have you ever gotten something and thought, “WHERE HAVE YOU BEEN ALL MY LIFE?” Well, this is how I feel about #6, My Paint Saint… and my Bobby, of course!!! I most highly recommend this genius, so-smartly thought out product! And you know that I am very very fussy about what I give such high praise!!!! 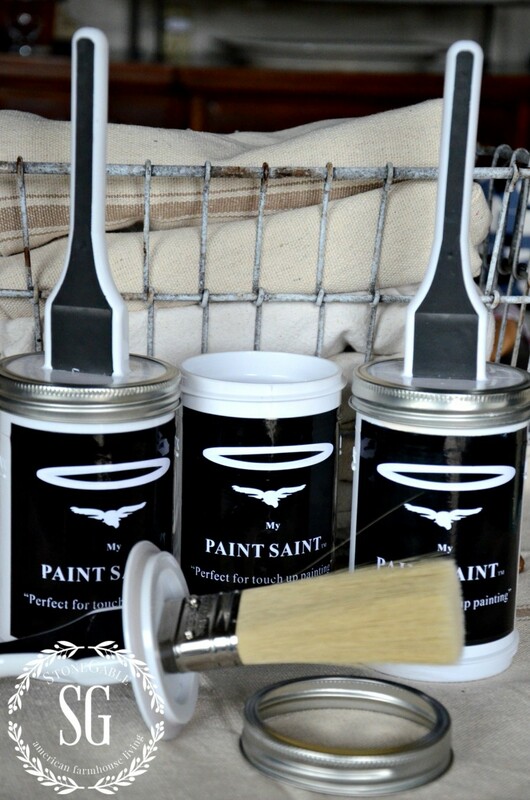 My Paint Saint is a way to keep your painting jobs looking like new! If you are like me… I’m always finding little areas on walls and woodwork that need a little touching up. UGH!!! I hate to get out the painter’s drop cloth, the can of paint (I can never remember where I put it), the screwdriver to open the can (I usually end up opening the can with one of my dinner knives), a paint stirring stick and a paint brush to do a little touching up… And then I have to clean it all up and put it away! I DON’T DO THAT ANY MORE!!! I really love love love this handy and well thought out container that keeps paint ready to touch up with NO MESS! There are so many fabulous features about this touch-up-in-a-can… like the great built in brush and the ingenious closing ring that attaches to the bottom of the can so you will never loose it. Take a minute and see My Paint Saint in action! You will be so impressed!!!! Click HERE to see all amazing My Paint Saint features! You will really like this little video… I’ll wait till you get back! My Paint Saints cannot be bought in stores… at least not yet. 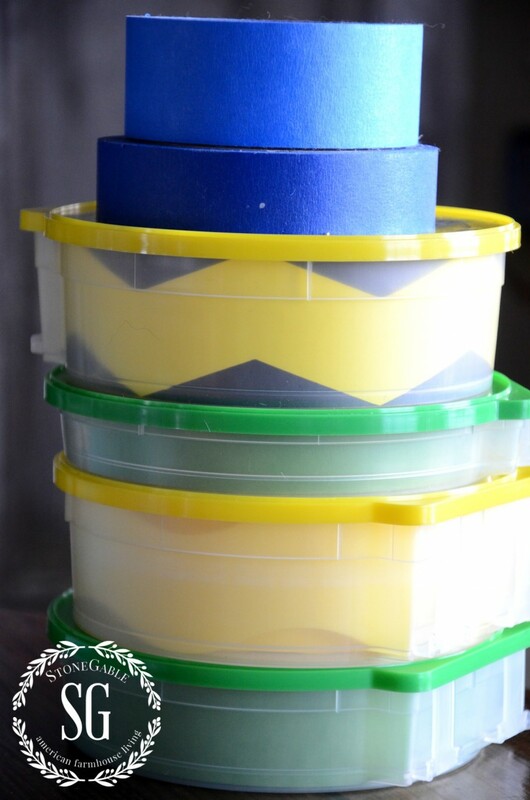 We, bHome bloggers, had the opportunity to get these WONDERFUL touch up paint containers… and not only share them with you but give you a chance to get some for yourself!!!! My Paint Saint is a part of the Kickstarter Program. Where created projects come to get noticed, funded and then go to the marketplace! Buying a My Paint Saint not only gives you an amazing product but helps this product to reach the market!!! I’m bought a trio for each of my kids and their spouses for Christmas. What a great gift! I’m also keeping some on hand to give as Wedding shower gifts and Housewarming gifts. Here’s how it works… you can buy My Paint Saints on the Kickstarter Page. Mark, the inventor of My Paint Saint, has 60 days to sell them and make his goal. If he does, you will get your My Paint Saint products in November of this year (see discount offer below in bold print). If he does not reach his goal (we feel sure he will reach his goal) then NO ONE gets charged. This is not a fly-by-night operation and can be trusted. Just think you can get this wonderful product far before it goes on sale in your local hardware and other stores!!! There is a special discount offer for you, if you purchase MPS from 7/1 – 7/7 and come back & leave me a comment that you did, you will receive 10% cash back & delivery in October! A MPS that costs $20, including shipping now will only cost you $18, including shipping. What a deal! This offer is limited in quantity & duration, so get over to the My Paint Saint page & get one, or better yet, a set, for yourself! Then pop back over & tell me your name & that you made a purchase. When your MPS arrives open it up to find your discount inside! Please help Mark make a long-time dream come true. And get this ingenious product to make your touch up painting a breeze! It’s a win-win!!! And I’d love it if you would give this post shout-outs on your social media!!! Thanks! I really love this product! 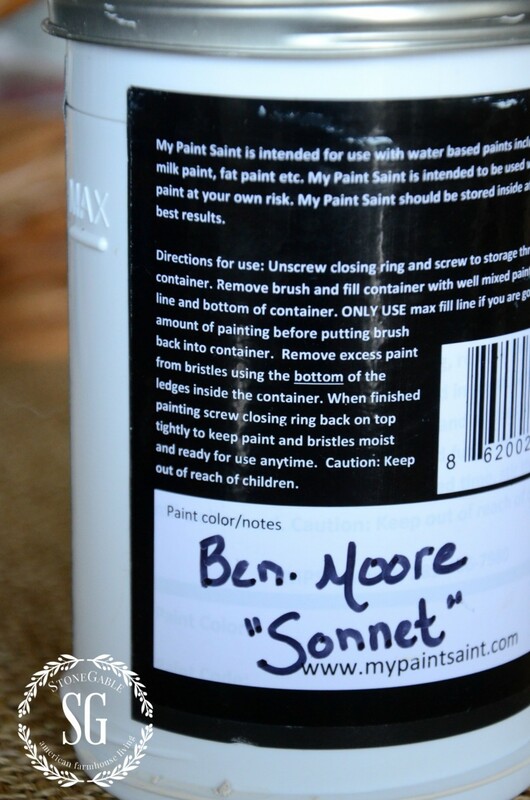 bHome and My Paint Saint is giving away one My Paint Saint a day for 7 days!!! Click HERE to enter to win! Remember to pin this to your HOME IMPROVEMENT or PAINTING Pinterest boards. You can follow me and see all the great things I am finding to pin HERE. 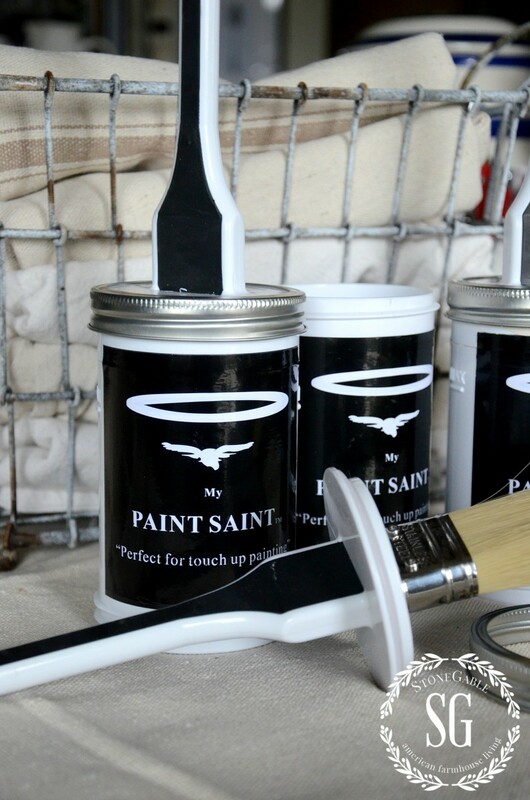 Can you tell me where I can buy the My Paint Saint product? I checked HomeDepot and online it says out of stock and not sold in stores. A similar result from Bed Bath and Beyond. Amazon says “Currently unavailable. We don’t know when or if this item will be back in stock. Walmart site says “Shipping not available – Pickup not available. Has the company discontinued making this product? I’m repainting my entire house and both my daughters had new homes built in the last 2 years. I’d like to purchase a dozen. That’s 4 for each of us. Thanks for any information you can provide. I didn’t make the giveaway, but I am excited about this product and I just ordered my first one! Just thought I would let you know! MPS is just what I need. Going to get rid of old gallons of paint. This will be a great space saver and so handy. Love this idea! Pledged for 3 to start out with. Wish I had them now ! Much success to Mark with his invention! Thanks, Shasta! We are all very excited about this great product too! As a preschool teacher I tend to turn a blind eye to household projects during the school year but summer has arrived and I’m aghast at what needs to be done. Painting is not a favorite so I was really excited to see your post today, especially MPS. I ordered 3 and hope that will help Mark out a bit and inspire me to do some touching up even if it will be after school starts. You will love your MPS! Hi Rebecca, you will love your MPS!!! I just signed up under the $75 plan! I am so excited! This is the best idea ever for painting. Guess what my kids will get in their stockings this Christmas!!!!!!!!! I think Paint Saint product is going to be a huge success. I just order 4 but it sadden me that I will not get them until November. I will be thrill when they arrive. You will get them in October at a discounted price!!! Be happy!!!!! My first Kickstarter campaign. Wish I had them now! Thanks for letting me know about the paint Saint. This is just what I need. I just committed to 2 Paint Saints. I sure hope they reach their goal for this great product. Thank you for the post. Love this idea!!! Awesome creation. Yvonne, can you tell me what kind of painters tape you use? I’ve used the ‘blue’ before but it didn’t work…. thought maybe because the wall was too heavily textured…. maybe it truly was the tape. And I cannot for the life of me get those little edgers to work…. I constantly leave the wall paint on the ceiling whenever I use one. If you have a “textured” wall Frog tape has a great tape for your kind of walls. Thanks Yvonne.. I’ll check it out. I just made a commitment for 3 Paint Saints. I sure hope he gets the support he needs! Thanks, Lisa!!! You will love MPS! What a great idea! And how wonderful of you to share it with us and at the same time help this company get started! Ordered a set of 3 and know it will make touch ups so much easier. Love your other tips as well! I just purchased and signed up for a 4 pk of Paint Saint on Kickstarter. I would love to get these in October! Thank you! Shirley, Michelle, Cindy, Mary, Julie, Pamela, June, Jeffrey, Pat, Tina, Margie Thank you all so much! I Have worked on this for so long it is like my Baby. Reading over these comment almost brought tears to my eyes. You guys are complementing my baby 🙂 and every parent knows how awesome that feels. Your Blog brought thunder to MPS today – Grateful! Well, Mark! I’ve been using your “baby” and I love love love it!!! I’m very choosy about what I will endorse, and My Paint Saint is a winner!!! I know it will be a big success and a huge help to millions of people who love their homes! Thanks for bringing us something that is so ingenious and needed! Thanks for the recommendation! I went to the Kickstarter website and purchased 1 Paint Saint. I think this is a great idea and hope this project happens! Your newest product looks amazing!!! Hi Pat! So nice to hear from your! MPS is awesome! MPS is a great idea. I also use baby wipes to clean random drips. You can buy the cheap brand for painting. I also like non-latex gloves. I am a messy painter! Gotta get those baby wipes!!! Thanks! What a great idea. I love the entrepreneurial spirit. I just signed up for a set of three. I wish them all the success. Great! Will make sure to get your your discount and early delivery! What a great idea My Paint Saint!! Great painting tips also. That is a great product! I would really like to get one, as I have lots of painting projects coming up! Such a great idea!! Oh and P.S. Yvonne….I think I will try that trick on my hubby and maybe I can score a great bracelet too……or a new chair!…You two are made for each other….as my mom would say, “You are two pods in a pea” !! After 33 years of marriage, I think I’ll keep him!!! It too too long to “train” him, as my mother says! Kidding aside, he is a gem! Yvonne, What an awesome post! You are so cute, I want to come and paint with you!! I love My Paint Saint! Great ideas, Yvonne, and My Paint Saint is AWESOME! p.s. Kudos to you on the gold bracelet ~ my husband is our resident DJ here as well…I have sung songs for years (my version anyway) and now with YouTube with lyrics I’m shocked at what I’ve been singing 😉 My playlist has certainly dwindled down. Me to MB! I should do my own version of the songs!!! I just love the tune to “It’s all about the base…” I had no idea what I was singing! I enjoy your blog, Yvonne. Did you mention you were thinking about another bathroom update? I hope you will share some of your ideas about that soon. I would like to try to do some sort of update to mine over the summer and would love the additional inspiration! We have our main bathroom on the schedule for Winter 2016. Winters are are major project season. Oh my gosh. What a fabulous idea! I have to have the Paint Saint! Just contributed for 2 My Paint Saints, just wish I didn’t have to wait until November! 🙂 What an awesome concept. MPS right up there with Bobby!! WOW!! Everyone needs at least one! Great Tips!! You will love this product!!! I am in the middle of painting the kitchen/laundry room and, agreed, I would never be without my trim roller. Fast and precise, love it. I am loving Ben Moore Horizon. Thanks for the daily inspiration! I’ve gotta check that color out! Thanks! matter of minutes from reaching for The Paint Saint, brushing the paint on the wall, and putting it away! Great product. Looks like a great idea! Another think I can’t do without — baby wipes. They are great for cleaning up and oops paint drips. The lanolin really helps get the paint up. If it’s fresh it works on water based paints and oils. Great tip Marisa!!! I’ll have to keep that in my painting arsenal!